Grilled shrimp is a great way to add seafood to your cookout. 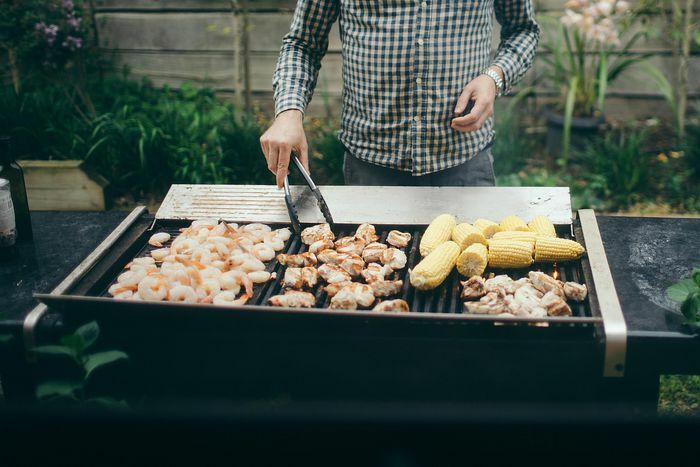 While it seems easy enough to toss a few shrimp on the grill, there are some barbecue tips and tricks that will help you make them even better. The secret to perfectly grilled shrimp begins with the preparations, from selecting shrimp to skewering and seasoning. The actual grilling part is very easy and extremely fast; overcooking is the biggest mistake backyard chefs make. We'll walk you through each step, giving you the keys to great barbecued shrimp every time. At the store, you will find a variety of shrimp ranging in size from extra small to extra colossal. Large and jumbo shrimp are most common and economical. They're also a great size for the grill. When determining how much shrimp you'll need, keep the count per pound in mind. You will usually get 30 or so large shrimp per pound and around 20 or so jumbo shrimp per pound. If shrimp will be your main dish, count on 1/3- to 1/2-pound per person. If you choose to leave the shells on, make it 3/4-pound per person. For safety and flavor reasons, do not refreeze shrimp that have been thawed out. This includes those displayed on ice in the grocer's case, which were most likely previously frozen. Most people who do not have a ready supply of live shrimp available will actually be better off with individually quick frozen (IQF) shrimp. You can grill either raw or precooked shrimp. Both will grill up quickly, but those that were previously cooked will be even faster and you'll essentially just need to warm them through. It's important to ensure that your shrimp is fresh, even if it has been frozen. According to the U.S. Food and Drug Administration (FDA), it is safe to eat thawed shrimp if they have translucent and shiny flesh. The smell can often be a better indicator, though. Shrimp that are okay to eat will have a light saltwater smell. Any strong, rancid odors, especially the smell of ammonia (rotten eggs), indicates that they need to be thrown away. Also, you should not eat shrimp that smell like chlorine or gasoline, which they could have picked up while being caught or during the freezing process. In a large bowl, combine 2 tablespoons baking soda with 1 quart of water. Add the shrimp and let them soak for 10 minutes. There are two great debates when cooking shrimp: shell or no shell and vein or no vein. Each has its advantages and there is no right or wrong answer. While most Americans prefer shelled shrimp without the vein, whole shrimp are preferred in much of the world. The main advantage is that you get to enjoy all of the crustacean's flavor. The shell will also protect the shrimp from drying out on the grill. You must remove the shell to devein a shrimp. If you don't like the veins, that may make up your mind right from the start. Depending on the type of shrimp you buy, they may already be deveined and shelled with only the tail left. Leaving the shrimp in the shell makes preparing them fast. Your guests will have to remove the shells while eating, but if you're outside anyway, the mess is not a big issue. On the flip side, without the shell and vein, shrimp are easier to skewer. This is also the better choice if you're going to season them with a marinade because it allows the extra flavor to get inside the shrimp where it will have more impact. If you choose to devein shrimp, simply use a small pairing knife or deveiner. Cut a slit along the back and remove the black, stringy vein. With your shrimp prepared, it's time for the fun part. Seasoning shrimp can be as simple or complex as you like and there are many tasty grilled shrimp recipes to choose from. If you're looking for something simple, coat them in olive oil, flavored butter, or barbecue sauce. These can be brushed on while the shrimp are on the grill, but you'll have to work fast. You can also add a variety of herbs and spices to create a custom marinade. Garlic, paprika, or cayenne will create a spicier shrimp and are great with melted butter. A marinade of lemon juice with cilantro, basil, garlic, and cilantro gives it a tangy, herbal taste. In general, marinating shrimp only takes 30 minutes. While you can simply toss individual shrimp onto the grate, skewers make the job easier. They eliminate the risk of a shrimp falling beneath the grate and you can remove and flip a skewer faster than individual shrimp. It's best to soak wooden skewers to prevent the wood from burning and reduce the chance of eating splinters. If you use metal skewers, a small amount of cooking spray will make getting the shrimp on and off easier. Straight Down the Middle: This is used more often for prawns because they have a straighter body, but you can skewer shrimp lengthwise as well. This may be easier if you choose to keep the shell on and creates a finished grilled shrimp that is nice and straight. Top and Bottom Curve: The most common method for shrimp is to skewer them in two places, accentuating their tight curve. Simply stick each shrimp once through the top and again near the tail. 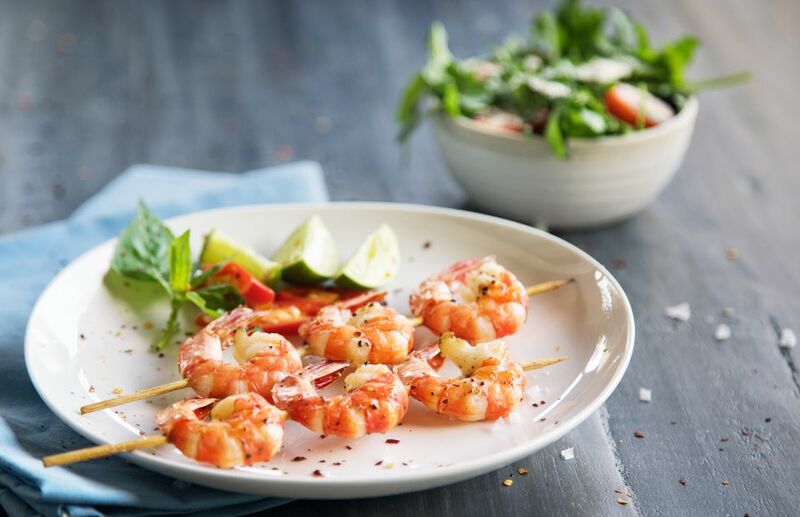 Double Skewer: To reinforce your shrimp skewers, ensuring no shrimp falls off, use two skewers. Stick each shrimp in the head and tail, but do it a second time with another skewer. This method also makes flipping the skewers super easy. However you choose to skewer them, don't overcrowd your shrimp. Leave a little space between each so they cook evenly. Since they cook faster than vegetables, it's best to keep shrimp on separate skewers rather than mixing the two as you would with a traditional kebab. The last secret to great grilled shrimp is to avoid high heat. It cooks them too fast and you run the risk of overcooked, rubbery shrimp. Instead, wait for the grill to get down to a medium heat. You should be able to hold your hand over the grate for four seconds. Once you get the ideal temperature, set your skewered shrimp on the grate so they are not crowded. Raw shrimp is done once the entire body turns a different color—usually from gray to pink—and it has a pearly, opaque appearance. This should take around 5 minutes and you'll want to flip them halfway through. If you're grilling precooked shrimp, your goal is to simply heat them up and impart a little barbecue flavor. This should only take 30 seconds to 1 minute on each side. Since you can't tell by color (they're already pink), you'll have to use your best judgment. In total, the shrimp should not be on the grill longer than 2 minutes. U.S. Food & Drug Administration. Fresh and Frozen Seafood: Selecting and Serving It Safely. 2017. How Do You Grill Fish and Seafood Like a Pro?